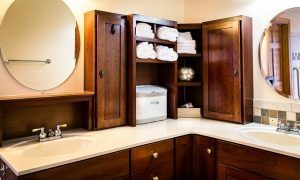 We specialize in the installation bathroom cabinets. Throughout our 7 years of service, we have been adapting ourselves to the latest technologies and trends in the industry. With our stock of kitchen and bathroom cabinets, we can offer unbeatable prices, which offer significant savings for our customers. Quality is assured, as we work with the best materials and cabinet brands on the market. We bring ideas and designs, always looking for the greatest use of space. A bathroom is probably the most difficult space to decorate in the entire house. Not only must we integrate functionality, quality and your style but it must be done in a small space. That’s why at Divine Design we have at your disposal a full catalog of doors, handles, drawers and many other accessories and we will advise you throughout the necessary decision processes. Regardless of the brand line you choose, we have semi-custom and fully custom cabinets to fit in with your style. From the most traditional materials and finishes to the most modern and innovative, will find the perfect combination that best suits your project. Faucets and bathroom fittings will give your bathroom a consistent look perfectly integrated into the whole space. Tile, mirrors, lighting all add to the overall look of your bathroom. With our customers in mind, from the beginning Divine Design has sought to provide full service. From sourcing the best brands of cabinetry to fixtures and the raw materials needed to not only provide clients with an excellent variation but to be able to provide installation services and therefore control costs. Everything that makes up our kitchens and bathrooms, from countertops and accessories to appliances, taps or screens, are of excellent quality. And this is because we work with the best brands in the market to guarantee the satisfaction of our customers.